OFF! Diversey Care Off! 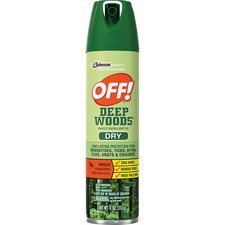 Deep Woods Dry Insect Repellent - Spray - Kills Mosquitoes, Ticks, Flies, Gnats, Chiggers - 4 fl oz - Clear Insect repellent features an advanced formula with deet to provide long-lasting protection from mosquitoes, ticks, biting flies, gnats and chiggers. Nongreasy design goes on dry to prevent your skin from feeling oily or sticky. 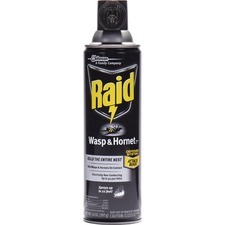 Aerosol spray allows you to accurately apply this repellent in a continuous sweeping motion for effective coverage. 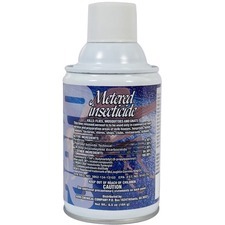 Insect repellent is perfect for use when fishing, hiking, hunting, camping and more. 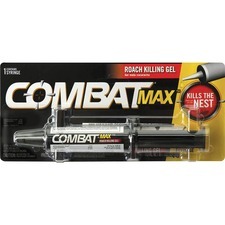 Combat Max Roach Killing Gel - Gel - Kills Cockroaches - 1.03 oz (0.06 lb) - Multi Roach killing gel features fast-acting ingredients to start killing both large and small roaches within a matter of hours. Gel formula attracts roaches in search of food and water to the bait and creates a domino effect to eliminate the source of the infestation. Easy-to-use syringe allows you to quickly place baits throughout your home or office to provide a quicker and more thorough kill. Roach killing gel is perfect for use on shelves, near trash cans, behind toilets, under sinks and more. 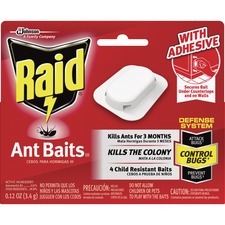 Raid Ant Baits - Kills Ants, Bugs Ant Baits feature an advanced formula that ants can't resist to quickly rid your home or office of ants for up to three months. After ants feed on the bait, they return to the colony and transfer the bait to the queen and the others, thereby killing the entire colony. Adhesive backing allows you to secure the baits under countertops and on walls to keep them where you need them most. Child-resistant baits are perfect for use indoors in closets, kitchens, pantries, bathrooms, waste receptacles and more. 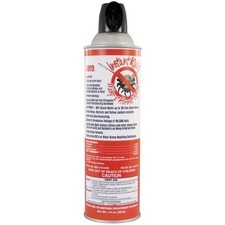 Aero Metered Insecticide - Spray - Kills Flies, Mosquitoes, Gnats This time released aerosol is to be used only in commercial food service and preparation areas of milk houses, hospitals, hotels, motels, factories, stores, ships, clubs,restaurants, schools. 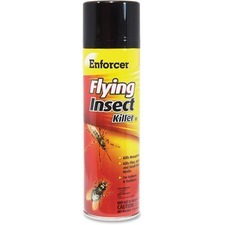 Use this insect spray to kill mosquitoes, flies, gnats and small flying moths. 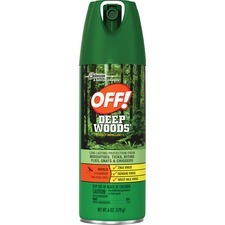 Insect spray provides eight hours of protection from mosquitoes. 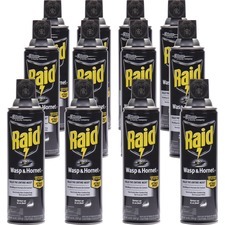 This water-based spray can be used both indoors and outdoors. wasps and hornets return to nests. Prevents nesting. Conductivity: 49,500 volts, Net 14oz.